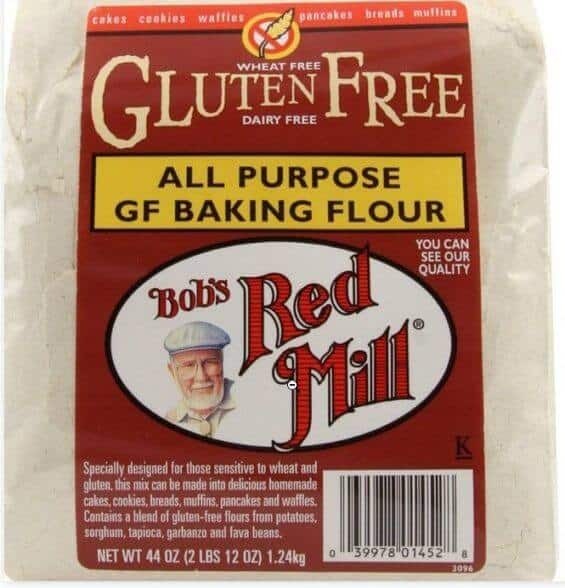 Bob’s Red Mill Gluten Free All Purpose Baking Flour is from the trusted brand that creates stoneground traditional flours, mixes, cereals and other baking necessities but without the gluten! Bob’s Gluten Free Mix Contains garbanzo bean flour, potato starch, tapioca flour, whole grain sweet white sorghum flour, fava bean flour. This mix is intended to be used with xanthan or guar gum, both of which are food additives that act as stabilizers to prevent the ingredients from separating and as thickeners. 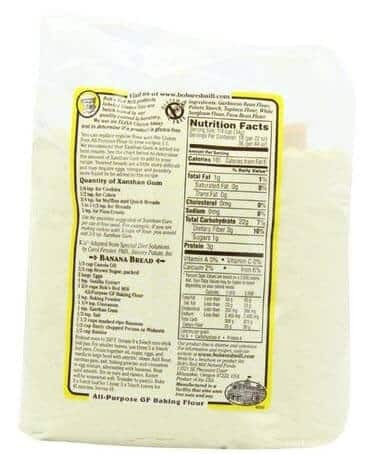 The bag’s back label includes the amount of xanthan gum recommended to be used based on the recipe type and amount of gluten-free flour alternative you are using. For Example, ¼ tsp of xanthan to each cup of flour is used in a cookie recipe. Chewier bread recipes like pizza dough crust require the most. Bob’s Red Mill Gluten Free Mix contains about three times as much fiber as regular all-purpose (3 grams per ¼ serving vs. less than 1 gram of regular flour) flour, making it a somewhat more nutritious and lower carb option for everyone, not just those who need to avoid gluten. The bag also includes at least one recipe on the package to get you started such as chocolate chip cookies or banana bread. While many customers did have a good experience with the flour, the garbanzo bean, and fava bean flours can tend to lend a less than pleasant “grassy” taste to things, especially sweet baked goods. Things like pizza crust can fair better depending on your taste buds. You will also want to take into account the need for xanthan gum which can be somewhat pricey on its own, but you don’t need too much in each recipe so it can still be reasonable as you will have the same package for some time.